It was my birthday. I was in Louisiana and I had just read an article by John Sherman stating there are definitely no rocks to climb in this state (he had done multiple recon missions and come back empty-handed each time). Without the draw of a good crag we decided to explore what other exciting things the natural (and unnatural) surroundings had to offer on our way to New Orleans. Turns out the state is not entirely swamp, though we did stroll on some amazing boardwalks through the bayou (including the one above, at Lake Martin) and saw a some very large alligators. On one of our explorations of the swamp, I tried to convince Andreas to cross one of the boardwalks submerged under floodwater. Just as he began to refuse based on his suspicion that Alligators were waiting to bite his feet off, we spotted a six foot ‘gator slide from the bank into the river not 10 feet away. This time, I reluctantly agreed that the underwater boardwalk may not be the best adventure for the moment. Not only were some of the boardwalks flooded but many homes and businesses too. They day before we drove over the state line, Louisiana had been pounded by record breaking rains. The downpour caused unexpected flooding after a period of drought. Lake Charles, Louisiana, measured only 0.12 inches of rain for the first 28 days of May, then picked up 2.87 inches of rain in one hour on the 29th. Other towns in the areas we drove through received 10.77 inches of rain in 24 hours. Many residents found a new unexpected and unwanted moat around their house. Now we understand why so many houses on the south coast sit on stilts. Fortunately, all the roads were still open and we were able to go on an adventure touring the state. We went from Lafayette to New Orleans on Route 182 (that parallels the faster yet less scenic interstate 90). We drove by small town after small town lined with large and beautiful plantation estates built in the 1800’s, hidden behind towering Live Oaks draped with Spanish moss. The most magical estates also included a driveway covered with a perfect tree canopy. The photo above is of a 180-year-old plantation home we toured in New Iberia, called Shadows of the Teche. It was surprising to hear that this house was built away from the sugar plantation so the Weeks family could live in a less remote area, especially considering it was only the third brick house in the whole town. We enjoyed the fact that the tour went inside the rooms and we could see the actual furniture and decorations from its heyday. The Weeks family kept meticulous records and documented everything imaginable, so there is a lot more known about the history than most historic homes in the area. The most recent resident of the house was the fourth generation son, William Weeks Hall, an artist by trade. He often held large parties for aristocrats that included the likes of Walt Disney and Mickey Mouse (who both signed their names on a door of fame). Before his death, Hall he gave the house and property over to the National Trust for Historic Preservation. The tour guide for the Weeks Mansion suggested we sidetrack our journey briefly and make a stop at Avery Island – the location of the world famous Tabasco(R) sauce factory. The factory tour is quite short, but interesting to hear that the recipe for the original Tabasco(R) sauce has remained the same since its invention in 1868. It was also curious to learn that making the pepper sauce was a hobby that accidentally turned into a business. The owner, Edmund McIlhenny, was a banker making sauce in his garage during his spare time, and started to give it out to friends at Christmas. These friends soon asked for more to give out to their friends. Recognizing the sauce was was an instant hit, production started soon after for Tabasco(R). The first year less than 1,000 bottles were sold and today production can reach 700,000 bottles… a day. Tabasco(R) still uses salt mined exclusively from Avery Island to create their sauce, although they’ve grown a bit too big for production to harvest all the peppers locally, now most the peppers are from South America. The most awesome news about Tabasco’s success is that a sizeable portion of the profits go towards the upkeep of Avery Island and it’s 170-acre botanical gardens. You can pay a few bucks to drive or walk the grounds and see ‘gators, turtles, snakes, birds and even armadillo’s! Over 1,000 Snowy Egrets at “Bird City,” enticing the alligators that roam the murky waters. One of two baby armadillo’s we found scavenging for food. Live Oaks shaded us from the beating sun and held our gaze upwards. After wandering and enjoying the scenery for hours we made our way to New Orleans in time for a locally-harvested dinner with unparalleled flavors at Maurepas Foods. Seriously, marinated carrots with pickled shiitakes and melted manchego cheese. Who would have guessed that would be a killer combination?! And the house tonic created the first G&T that I’ve ever considered absolutely delicious. If you see this view in person, you’re steps away from Cafe Du Monde’s famous beignets. Then it was time for music, the part I had been eagerly awaiting ever since I knew we were going through New Orleans. I expected a somewhat low key endeavor even though it was Friday night, since we weren’t coming during tourist season. I pictured lots of venues with live music but I was in no way prepared for what we encountered. Bourbon Street seemed as if Mardi Gras was going on at the exact moment of our visit. There were thousands of people stumbling in the streets and many more on every balcony throwing beads. The lack of an open container law encouraged everybody to have a beverage in-hand, as did the “free refill’s all night” frozen daiquiri signs. The music blasting from the open doors was so loud it almost drowned out all the drunken calls from the streets. The streets were so crowded it was nearly impossible to look down at what you were stepping on, but that might have been a good thing. Take 10 people out of this photo and that’s how busy it was (photo: Jade Broadus at travelmindset.com). Unfortunately, our first pass down Bourbon Street didn’t result in any fantastic blues. We were baffled. In the end we actually felt more comfortable on the less busy side streets, as we enjoyed listening to the powerful and talented street performers until the wee hours brought us home. Fantastic image by John Batdorff (johnbatdorff.com) of two street artists we saw perform. It was surprising (less in retrospect) to see so many bachelorette and bachelor parties in attendance–guess I’m still not in line with the whole debauchery idea. Weddings on the other hand were a tear jerking spectacle to witness. 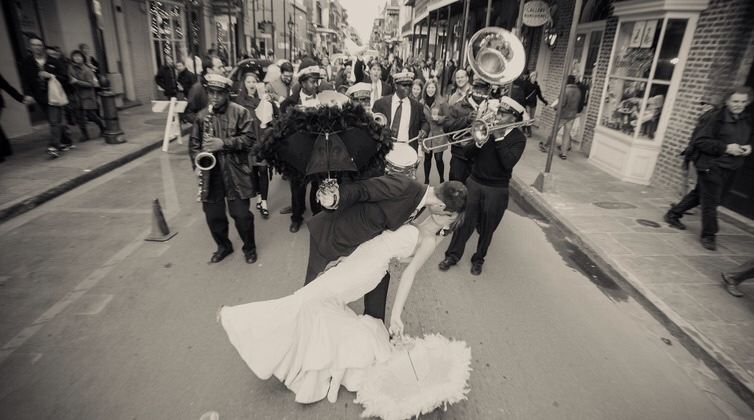 The New Orleans tradition is to have a Second Line Parade lead you from the wedding ceremony to the reception. This includes police vehicles barricading the way for your personal wedding parade, propelled by an energetic Dixie Jazz band. The bride and groom dance merrily with swinging parasols while the wedding party waves flags and tosses beads as they parade to the next venue. A lovely image capturing the moment by Maribeth Grant (borrowedandblue.com). After an incredibly busy and entertaining birthday, the next day, we toured the WWII museum (really well put together, we highly recommend it–you could easily spend an entire day going through the exhibits). This airplane-specific building was sponsored by The Boeing Company, my old employer. Then we found Frenchman Street. Frenchman Street had the vibe we desired. On Frenchman Street you could actually hear the music and some of it was great! There were a lot of historic hangouts and speakeasy’s and it felt like a perfect mix of dirty and clean. Here, you could even sit down and order an Old Fashioned Bourbon. It had the opposite mood of the crowded dance-club seeming Bourbon Street. The only minor downside was that you couldn’t walk in the middle of the street. On Frenchman Street, the super fun & talented Young Fellaz Brass Band (photo from whereyat.wordpress.com). If you ever find yourself traveling coast to coast, the South isn’t a bad way to go (this is the opposite advice of nearly every person we’ve talked to when we mentioned “the South”). The drive through Louisiana definitely kept us entertained and we were fortunate enough to stumble upon (thanks to Yelp/Urbanspoon) some really amazing restaurants that easily filled our vegetarian bellies. With the ever-present beckoning of unlimited music options, we actually wanted to stay in Nawlins instead of moving on east. But like Sherman said, there ain’t no climbin’ in LA. We’re happy to answer any questions in the comments! Alison runs WeighMyRack from her 17' travel trailer. She is currently touring the US and would love if you contacted her to meet up to talk about climbing, climbing gear, or if you have any fun and/or ridiculous adventure in mind.